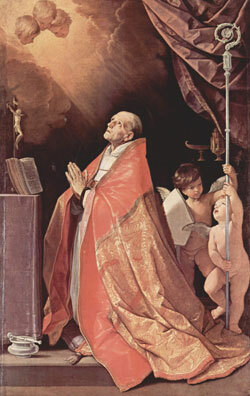 Saint Andrew Corsini (30 November 1302 – 6 January 1374) was a Carmelite Bishop of Fiesole from 1349 until his death. He led a worldly life and through the prayers and encouragement of his mother he returned to the Christian life, later entering the Carmelite order. Later named a bishop he continued an ascetic life (hair shirt, iron girdle, rough bed etc) concerned especially with ministry to the poor. On Christmas Eve in 1373 as he celebrated Midnight Mass the Blessed Virgin appeared to him and told him he would die on the feast of the Epiphany. After his death several miracles were reported in connection with his tomb. His body was found to be his remains were found to be incorrupt in 1385. He is the patron saint of diplomats, against civil disorder/riots.